If you timed my dinner prep tonight, you would hear a ding at 30 minutes. DING DING DIGGITY DING! 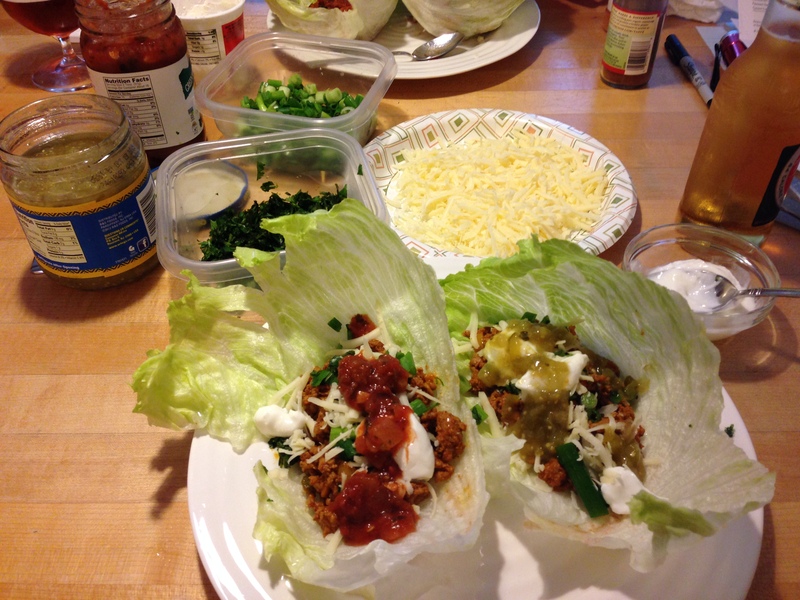 I found this Turkey Taco Lettuce Wraps recipe on SkinnyTaste.com. Shocking, I know. I think SkinnyTaste (aka “Gina”) is slowly creeping up on my Barefoot Contessa love. We all know that nobody can come close to my love for Barefoot Contessa (aka “Ina”). Not even Taylor Swift. Did y’all see her in the kitchen with Barefoot Contessa the other day? Gah. Anyway, my point is that I’m really glad I’ve found someone in the Weight Watchers world who likes to cook real food. Don’t worry, Ina. I’ll be back to butter in good time, sister. Oh, and both of them have “ina” in their name. Destiny, I tell ya. Anyway- so I stumbled on this Turkey Taco Lettuce Wrap recipe and followed it exactly. Just click HERE for the full recipe. Here’s what I loved most about the recipe: You can use a lot of toppings without using many points. The only confusing thing was I couldn’t tell how much meat mixture counts as your serving. So, I just measured out 1/4 cup for each lettuce leaf. 2 wraps = 4 points. Then I added 1 tablespoon of reduced-fat cheddar cheese (1 pt), some fat-free greek yogurt (o pt), green onions (o pt), salsa (o pt), and cilantro (o pt). I think you will really like it! My husband gave it an 8 out of 10 (even wrapped in lettuce, mind you). My 2-year-old protested LOUDLY and spit it out after pretending to gag and choke on it. Don’t let that influence you though because my kid refuses to eat anything that isn’t hummus, crackers, fruit, or cake. It’s just a fact and it is creating major havoc in the household, but that’s a post for a different day. Speaking of recipes and menus, I found a meal planning website and application called “Plan to Eat” over the weekend. I’m doing the 30-day trial to see how it works for me, but so far I am impressed. Basically, you install the Plan to Eat Recipe Saver as a bookmark on your toolbar. When you find a recipe on another website you want to try, you simply click on the “Save Recipe” button and it will automatically import the recipe in your file online. Then you can drag all of the recipes in a calendar for the week. THEN…(wait for it, wait for it) you can generate a shopping list based on your grocery store and all of the ingredients you need for each recipe. Brilliant. Since WW requires planning, I’m thinking this tool will be much easier than saving recipes to my phone and then trying to remember where I put them and then figuring out the ingredients to buy at the store and so on and so forth. You get my point. Check it out and see if it makes your life easier. That’s a low point lunch for sure. I’ve been using Sara Lee’s 45 calorie slices, so for two slices I get two points. I like the ZERO point (lettuce) option better though!